The idea of purchasing a corporate sculpture for your business has long been a way of enhancing the work environment for both your employees and visitors. Over the years I have provided works for both major corporations and small firms who understand the benefits for their business. Many businesses have created art collections which have proved a good investment both in monetary terms and the visual improvement of their premises. My clients include banks and insurance companies, as well as hotels some of which are detailed below. My clients include banks and insurance companies, as well as hotels some of which are detailed below. ‘Seated Woman’ sculpture for Kawaguchi Metal Industries, Japan. 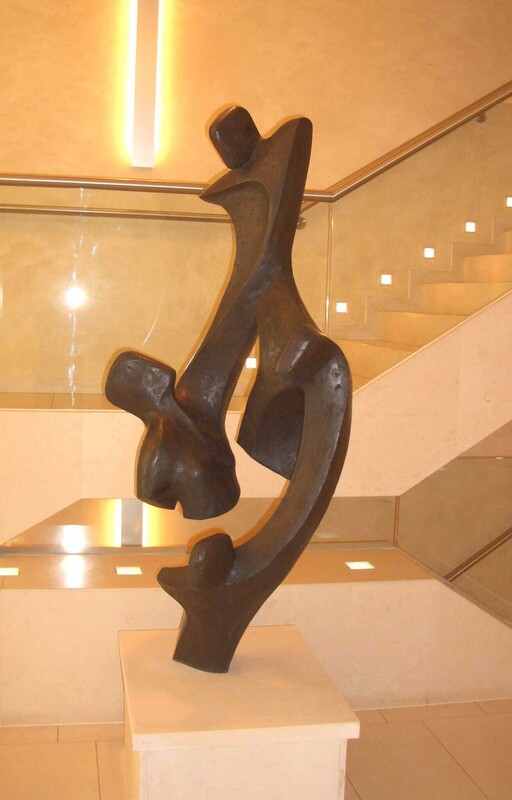 ‘Growth and Security’ – sculpture commissioned for USS. 3 sculptures purchased by MCL Group Ltd.
‘Interdependency’ commissioned by Marathon International Petroleum Co. The importance of your reception area cannot be over-emphasised. A welcoming atmosphere can be achieved by adding paintings or key pieces of sculpture. Often I can supply these from stock or create a specially designed sculpture suitable for the corporate image or ethos. An atrium, although it can be impressive for the visitor, may well need to be softened or accented with a suitably sized sculpture. These are usually commissioned to reflect the size and shape of the space. Corporate Sculpture for Boardrooms and Offices. A strategically placed bespoke sculpture in your boardroom or meeting room can emphasise your corporate identity and add individuality to the space. In an office environment an appropriate work of art can soften the atmosphere and potentially give greater job satisfaction. Sculpture as Gifts or for Reward Schemes. It has been the case that I have been asked to provide a sculpture as a special gift or prize for a reward scheme. This can be a commission for a retirement present or one chosen from my present stock of stone carvings or bronzes suitable for the home or garden. When a prize for a reward scheme is wanted, this is usually a specially created piece suitable for the occasion.